Keeping up with all of the blogs we read is hard enough, let alone on days when some crazy woman makes five posts in rapid-fire succession. Sorry about that, I just have had so much I’ve wanted to write about, and haven’t had the time to do so. I know on days when The Pioneer Woman goes a bit crazy with new posts, and I see her bolded in my Google Reader with a (6) next to her name, sometimes I honestly think, “Jesus, Ree – seriously?” But then I go and read them anyhow, and they’re all good and I feel bad for my moment of harsh judgment. When you gotta write, you gotta write. For you folks who follow this blog, sadly, there is no Ree-like goodness to be had – just me droning along. As I was driving to the farmer’s market today (which is a good half-hour away, and was closed – awesome,) I drove by a Hobby Lobby and recalled someone I follow on Twitter saying something along the lines of “How am I X years old and have never been in a Hobby Lobby before?” Well, here I am, never having been. I guess I’d always sort of thought of Hobby Lobby as a place full of model airplanes, scrap book supplies and paint. And it is, but oh my, it is so much more than that. There was also a preponderance of OMG CHICKEN STUFF! 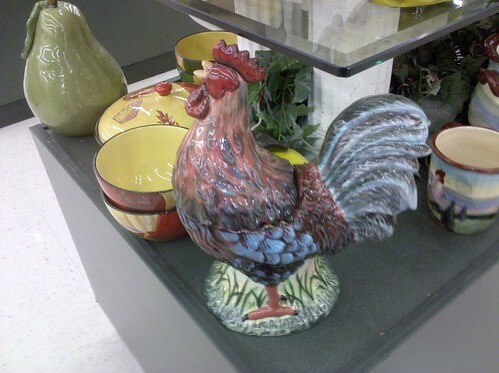 My last, ultimately mentally unstable roommate had a huge thing for chicken home decor items. I really did not get it at all then, and I am somewhat creeped out to say that I kind of do now. Mind you, I find a distinction between the ridiculous, garish, overly-done, hugely colorful and/or cute stuff and the (I can’t believe these words are coming out of my hands) more tasteful chicken art. 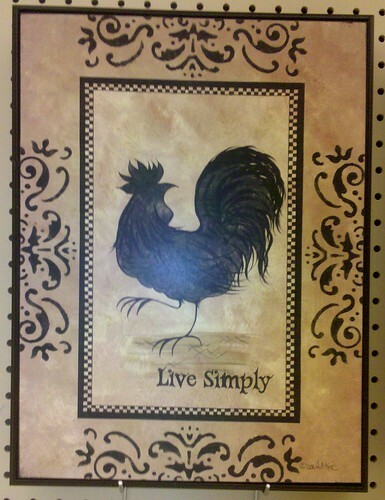 A rooster and “Live Simply? SWOON! 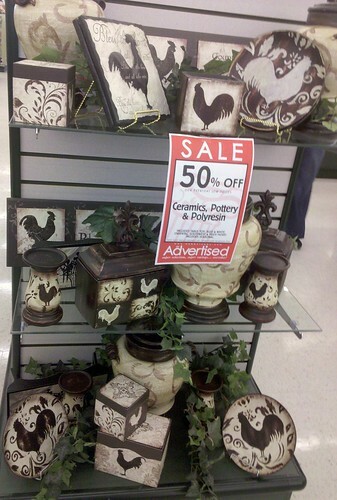 The irony, however, is not lost upon me – does one need gratuitous chicken art? No. Acquiring said art is not “living simply.” Dammit! Confound you, stupid ethics! Which simply do not titillate my chicken fetish at all. The saner amongst you are looking at that, comparing it to the photo immediately above, and going “what the hell. How is that any different?” It’s not (said she, wailing,) it just hits my button. 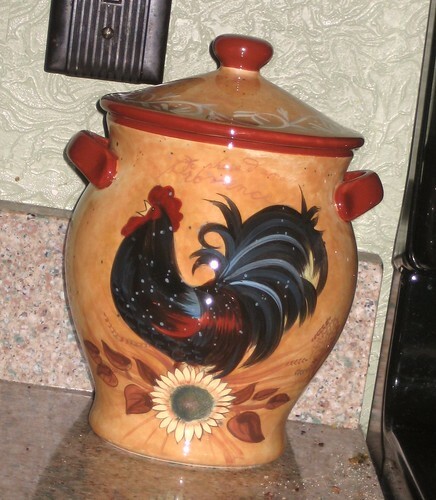 I love Tuscan colors… mustards, reds, yellows, oranges… and this is all of those things… PLUS A CHICKEN. Also, HOLY CRUMBS. Apparently, I hadn’t wiped underneath the previous resident of that space terribly often. About the giant sale sign that is clearly displayed in many of these photos – my brain tends to tune out the stuff that’s screaming at it, visually. It’s as if modern marketing has completely conditioned me to do exactly what it’s designed not to do. Instead of my attention being attracted to the GARISH BRIGHT HOT-PINK PACKAGE, I automatically tune it out as something I’m not interested in. 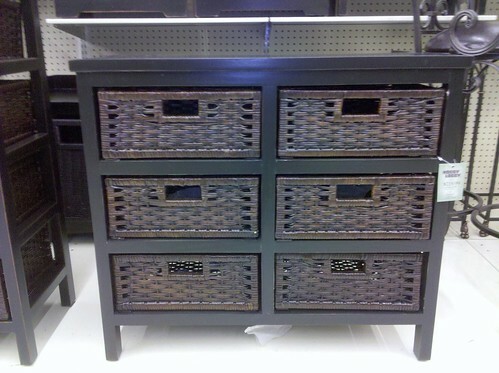 If you want to sell me something, try to do so tastefully. 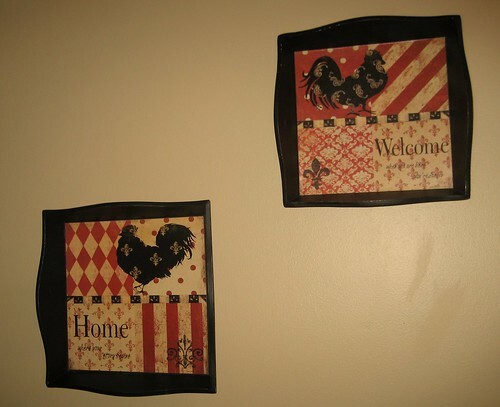 …because nothing says “Welcome” and “Home” like being greeted by wooden trays with chicken art on them. 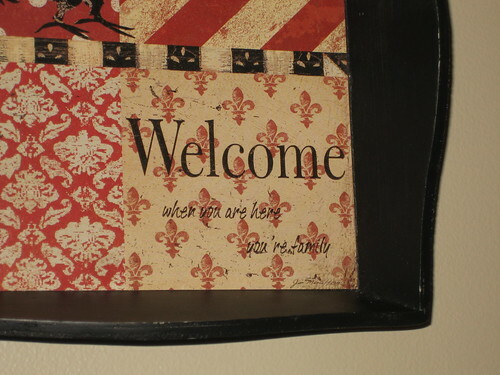 It’s not as if Mike and I regularly welcome anyone into our home at all, besides. But I love them so. 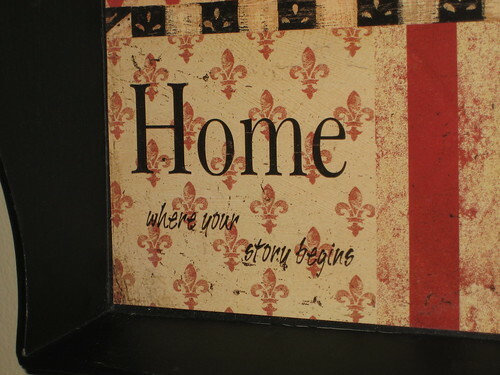 We may have to start having people over just so they can be welcomed by these. A special note to Mike Neir: I promise to try not to overrun our home with metric honkloads of chicken stuff. Honestly.